Local police patrols in Estepona have been working without radio contact with the central 092 emergency switchboard, and unions say, have had to use their mobile phones to keep in contact. The local police union told Málaga Hoy newspaper it’s due to a fault in the system detected two weeks ago.The CSI-F union is concerned at the effect the fault is having on the service the local police provides to the public, saying they cannot respond to emergency situations as quickly as usual and claiming also a lack of coordination between the different patrols.Estepona’s public safety councillor, Francisca Bernal, said none of the police have to use their personal phones, as in-house mobiles are available to officers when they go on shift. The delay in repairing the repeater station used by the 092 switchboard is due, she said, to the closure of many companies during the month of August. Stephen Kane and Nicholas Bell, both 29, passed on the drugs, which were posted from Chile, for sale to wealthy users on the Costa del Sol, Spanish police claim. 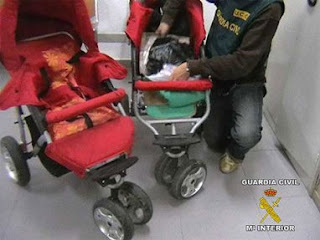 A gang which used babies to smuggle cannabis into Spain, hiding the drugs beneath the mattresses of their pushchairs as the smugglers went through Customs, has been broken up by the Civil Guard.The gang was part of a wider organisation which had a separate operation for posting cocaine from Chile hidden in bars of chocolate, while a third group was responsible for transporting stolen vehicles to Ceuta and, from there, to Morocco. The vehicles were sometimes completely dismantled into spare parts to allow them to be passed through Customs.21 arrests have been made in Ceuta, Málaga and Cádiz, and it’s understood that two of those in custody are British, although the Interior Ministry has released no details of their identities to the press. The others are five French nationals, 8 Spaniards, five from Morocco and a suspect from Chile. Another 13 people were not taken into custody but are suspects in the case.More than one and a half tons of cannabis and 300 grams of cocaine were seized during the Civil Guard operation, along with 11 vehicles and close to 60,000 € in cash. home-based treatment via telephone, messaging, DVDs, books etc. If your habits are dominating your daily life and you feel powerless to control the chaos, then it's very likely that you are suffering from an active addiction. The abstinence-based programmes use detox, the "12 steps", cognitive behavioural therapy, counselling, peer support, coping strategies, drug rehabilitation, coaching and teaching and more to help you and your carers and your family. Jorge Real,convicted for the murder of Tony and Linda O’Malley, the British couple who died while house hunting on the Costa Blanca in 2002, has written a book based on his life and experiences in the turbulent years of South American history in the last century. 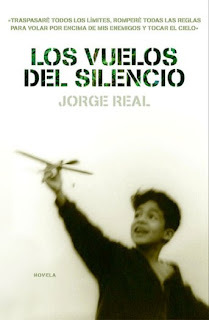 Written from prison in Córdoba by Jorge Real Sierra, ‘Los Vuelos del Silencio’ is an autobiographical novel which tells the tale of David, a boy who left life on the streets of Venezuela to become a pilot for the drug cartels and the Contras of Central America.The author says he will leave it up to the reader to decide which is fact and which is fiction.On sale from Plaza y Janés next month, his publishers told El País they decided to go ahead in publishing the book as the quality of the content stands alone regardless of the author’s current situation. They also said the text has no connection with the crime for which he was sentenced. Jorge Real was interviewed in prison by a journalist from El País, who he told writing the book during his time behind bars has helped him to face his internal demons, adding that any profit he gains from it will be for the family of the couple who died on the Costa Blanca. While still maintaining his innocence, he said he can’t find the way to ask for their forgiveness, nor for the hurt he has caused to others in his life.Jorge Real and his brother-in-law, José Antonio Velázquez González, were found guilty in 2006 of the murder of Tony and Linda O’Malley, a couple from Llangollen, North Wales, whose bodies were discovered buried in a cellar in Alcoy in March 2003. Real has another 28 years to serve of his sentence. Body bound at the hands and had a wound to the head, possibly caused by a bullet. Police in Benidorm are trying to identify a badly burnt body found in the Serra Gelada this Sunday after firemen and police were called out to a blaze near the border with Alfaz del Pi. Diario Información said the man’s body was still burning when it was found beneath a pine tree at the side of a dirt road.The paper said the body was bound at the hands and had a wound to the head, possibly caused by a bullet. It’s believed he may have been killed where he was found.No arrests have yet been made in the case. A 9.3 metre yacht which was heading for Britain has been intercepted by the Spanish authorities and found to be carrying 250 kilos of cocaine.Businesses on the Costa del Sol have been raided as part of the operationThe boat had set sail from the Dutch Antilles, and was escorted by the Spanish police into the port of Vigo after its interception.Eight arrests have been made in total, some of them on the Costa del Sol, and the nationalities of those detained are Spanish, Colombian, British, Dutch and Italian. 18 top of the range cars have also been impounded in the operation along with 300,000 € in cash, a jet ski, semi-automatic pistol, a revolver, 60 mobile phones, 20 computers and diverse documents.Investigations were carried out in a joint operation, codenamed ‘Candlelight’, between the Spanish Agencia Tributaria and the British Serious Organised Crime Agency after an organisation which introduced cocaine, heroin and hashish from South America to Britain and Spain was discovered.The bosses of the operation are thought to have been based on the Costa del Sol. Businesses on the coast are thought to have laundered money from the gang, in a second hand car showroom, and in two restaurants on the promenades in Fuengirola and Marbella. British man, who allegedly stabbed his father-in-law with a 25 cm knife. Diario Información reports on an incident in recent days in the Castillo de San Juan area of Orihuela Costa, involving another British man, who allegedly stabbed his father-in-law with a 25 cm knife. The suspect’s wife and son are reported to have witnessed the assault. British man was arrested after a police chase in the Dream Hills area of Orihuela last Saturday, for allegedly ripping off part of the ear of another man, a 44 year old also from Britain.The injured man was taken to hospital in Torrevieja by police, while other officers tried to capture his assailant. Las Provincias newspaper said he was finally captured in a wooded area next to the AP-7 toll motorway after narrowly escaping being hit by cars when falling down onto the carriageway from a height of 20 metres when jumping over the motorway barrier.The 23 year old is understood to have resisted arrest. Gang boss ‘Fat’ Freddie Thompson spotted in Puerto Banus after moving his operation to Spain after a gun attack on his home .The Irish Gangster has set up home on the Costa del Sol with a nephew of the Monk, it’s revealed. Both men survived a gun attack in Spain last year which left their pal, Paddy Doyle, dead. Thompson (28) relocated to an apartment in Marbella four weeks ago, days after a shotgun blast was fired at the front window of his family home in the Coombe in Dublin. The gang boss is believed to have told his associates that he intends to remain in southern Spain for the summer with fellow criminal Gary Hutch. Freddie is currently staying in Marbella with Gary Hutch (27), a nephew of Gerry 'The Monk' Hutch. A former courier and robber from Summerhill, Gary Hutch is a longtime associate of Thompson and a number of his pals on the Costa del Sol. Thompson and Hutch were both in a car with their pal Paddy Doyle in Estepona, near Marbella, last year when he was assassinate by underworld rivals. A source told the Herald: "Thompson has kept his head very low of late. He departed the country after the shooting at his family home, which followed a bomb alert close to his girlfriend's home in Crumlin. 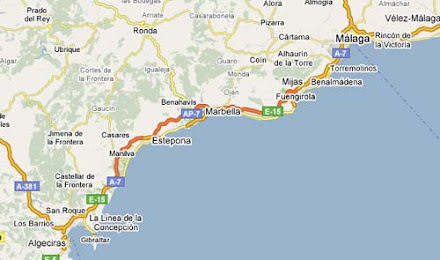 Thompson has previously established a base in the Marbella area, living in Puerto Banus, a smaller town close to Marbella itself. The criminal narrowly avoided injury in February 2008 in Estepona, ten miles from Puerto Banus, when a gunman opened fire on a SUV in which he was travelling, killing his close friend Paddy Doyle. Gary Hutch was also in the BMW X5 when the shooting took place and also narrowly escaped injury. Keith Abrahams, 40, of Hereford, has been arrested in Spain on suspicion of smuggling £5million of heroin into the UK. Keith Abrahams, 40, of Hereford, has been arrested in Spain on suspicion of smuggling £5million of heroin into the UK.Spanish Police have broken up a group of Foreign Exchange Agencies who are said to have laundered funds worth around 180 million euros during the last four years.The group appeared to be offering their services to tourists but were in fact dealing with British customers linked to drug trafficking between 2005 and 2009.The Operation began five months ago when officials detected a group of exchange agencies, primarily in Fuengirola, accounting for a disproportionate amount of transfers from pounds to euros despite a lack of British tourists in the area at that time.Investigators have claimed that the agencies played an important role for networks who needed to convert currencies in order to fulfill drug payments. Gary Well, 45, of London, was one of 10 people arrested in a series of swoops on a string of money-changing agencies in Fuengirola. Gary Well, 45, of London, was one of 10 people arrested in a series of swoops on a string of money-changing agencies in Fuengirola.Costa gang alleged to have laundered £155million for British drug dealers operating on the Costa del Sol has been smashed by Spanish police.The agencies were a cover for British drug gangs smuggling cannabis from Spain to the UK, police said.